The current Peabody Hotel building, on Union Avenue, was built in 1925 on the previous site of the Fransioli Hotel, which looked just like the original Peabody Hotel. Okay then. Named after George Peabody, noted businessman and philanthropist whose works helped the poor in America and England, where the Peabody Trust still provides inexpensive lodging. Room rates at the current hotel would have appalled his charitable side. And probably thrilled the part of him that knew how to turn a dollar. 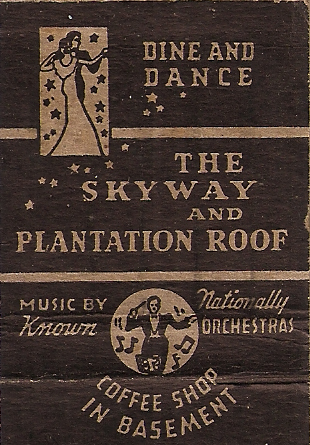 Interior of the matchbook.. Nationally known orchestras, mind you.